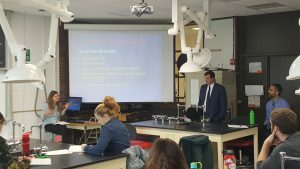 Assistant Attorneys General from the Attorney General’s Environmental Protection Division were guest presenters in an Environmental Toxicology class at Northern Vermont University-Lyndon on Thursday, December 6th. 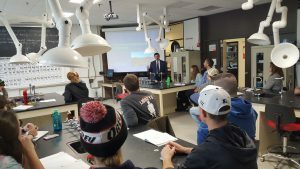 The environmental toxicology course introduces NVU-Lyndon students to the field of toxicology and environmental remediation, and touches on a number of different disciplines including chemistry, ecology, biology, physics, statistics and meteorology. 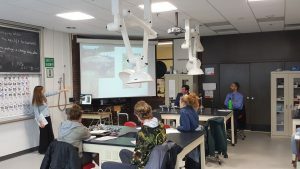 During their visit the Environmental AAGs spoke to the class about how the State of Vermont enforces its environmental laws, the role of the Attorney General, how we work with our State Agency partners and gave some examples of recent cases it has handled. The Environmental AAGs came away very impressed with the engagement and environmental knowledge of the students during the class. Thanks very much to NVU-Lyndon and Professor Ian Balcom for having us in to visit. We look forward to coming back again!